If you love your lawn but not the effort involved in keeping it lush and healthy, Jim’s Mowing Melbourne Northern Suburbs is ready to take on the task. We guarantee that our affordable services will transform your garden with beautiful, green, well-manicured lawns that will be the envy of the neighbourhood. You can finally enjoy a lawn you’ll be proud of all year round! Buying the tools you’ll need to get everything done around your garden can really add up. Why fork out money for equipment you know you’ll probably only use a few times at most? Jim’s Mowing have everything needed to do the job so you’ll never need to worry about the cost of buying tools and equipment or the hassle of ongoing maintenance and repairs. Your garden is often the part of your property that prospective home buyers see first. Mowing your lawn, trimming your trees, pruning hedges, mulching or even some low-cost landscaping can make a big impact when preparing your property for sale. 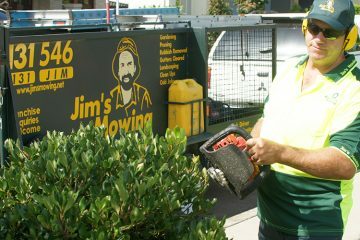 Jim’s Mowing can provide quick, easy and affordable ways to spruce up your garden and outdoor spaces and maximise your sale price. If you’re sick of your plants, trees and shrubs being eaten and killed off by insects or pests, then it’s time to take charge! Caterpillars, snails, ants, slugs and other annoying bugs in your garden will be no match for your Jim’s Mowing professional and their knowledge of garden pest control. Is rubbish, green waste or junk cluttering up your garden and taking over your life? 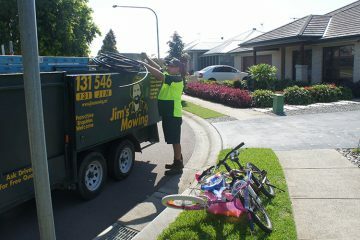 There is no need to hire a skip and try to get rid of it all yourself when Jim’s Mowing can assist you with their reliable and economical rubbish removal services. Whatever it is, we’ll work out the best way to get rid of it. Call us for a quote today. You’ll be glad you did! Are you scared of heights or ladders? Or maybe you have a bad back and don’t feel comfortable handling heavy garden tools and equipment? Don’t risk it! With Jim’s Mowing on the job, you can have guaranteed peace of mind knowing our professionals are fully trained to use all kinds of garden equipment and are covered by liability insurance. 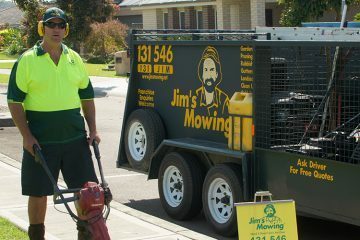 Welcome to Jim's Mowing Melbourne Northern Suburbs. If you think we only provide lawn mowing services, think again! Our professional team can provide garden care, landscaping, rubbish removal, gutter cleaning, and more affordable services to help you save time and money. Contact us today for an obligation-free quote so you can sit back, relax and let us do all the hard work for you! 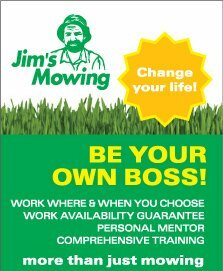 At Jim’s Mowing we are committed to providing affordable and professional lawn mowing and gardening services to our valued customers. For decades we have been helping Australians to transform their gardens and make their lives easier, and we can do the same for you! Our knowledge of your local area combined with our passion for garden care, means you can rest assured knowing your lawn and garden will be in expert hands.